After having tested the Arsenic bioassay on our own with standard lab equipment. We set out to do some testing with arsenic and our prototype (The Fluometer 1.0). To prepare the Arsenic solutions we used the same procedure as described in the previous article about the Arsenic bioassay. This time instead of using 200µl wells of a 96-well plates we used our prototype friendly 4 ml vials where we did a 1:1 mixture of Arsenic and bioreporter. We used the vial box to put the samples that needed to be in the incubator, that was set at 30 degrees Celsius and 220 RPM. We were able to make measurements at several time points : 1h, 2h, 3h, 4h, 7h30. The precision of each measurement is not complete as the measurement of each samples (triplicates for each arsenic concentrations) took quite some time so the measurement took place approximately during t-15 min and t+15 min. We were able to have an absorbance measurement for each sample to then compute their relative fluorescence. 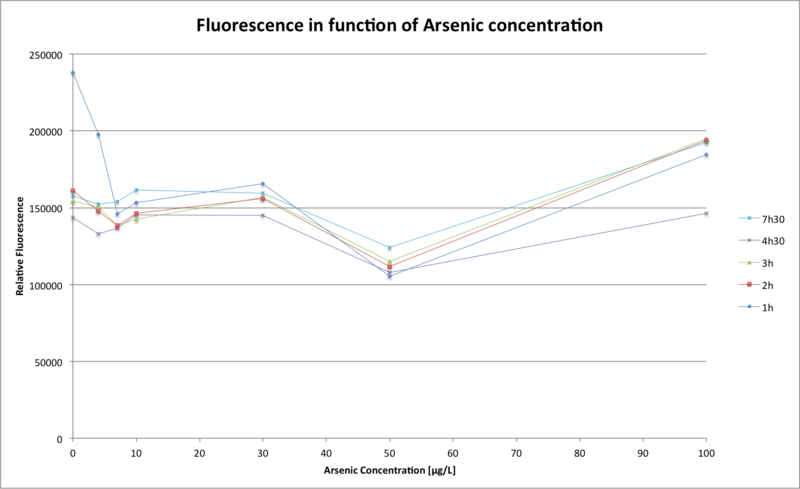 As we can see, we were able to notice a slight increase in the signal relative to the Arsenic concentration, even if it is clear that the 50µg/L measurements have all encountered a problem. We also remark that the signal does not increase over time even though the bacteria are growing in the vial, which we are sure about because the absorbance of each sample is growing. We think that happens because we had to close the vials completely to prevent spilling during the orbital shaking. One of the ways to prevent this would be to fill the vials up to half their volume (or 3/4) and then fill up the rest with medium at the time of the measurement. We could also modify the design of the prototype so that it is not mandatory for the measurements that the vial is completely full and that the measurements could be done while the vial is only half full. Professor Van Der Meer that vials at only half volume would contain enough oxygen so that production of GFP would be enhanced in respect to the current situation. We can see that the information that will be brought to us by the second design of the prototype (having a light diffusion measuring LED) is important because the dynamic range of this prototype is not great and it is not good enough for precise measurements.